The second and third pens I've turned. On the left is a "learning experience". It started out as ebony, but I had such trouble turning it I ended up with a huge blowout. I repaired it by cutting off the blown out part and gluing a block of padauk onto the barrel. It worked OK but I had real issues with the CA glue finish. On the padauk it went wonderfully. On this ebony/padauk pen it bunched and blobbed and did things that didn't happen to me the first time. 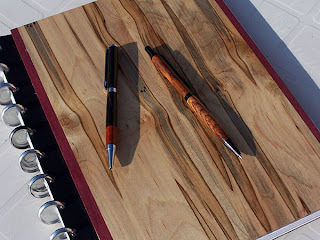 For the kingwood pencil, however, I changed my finish. Instead of the CA glue, I used 10 coats of shellac. A 1 lb cut applied to the spinning blanks with an old cotton sock gave an amazing finish. No ridges, no bumps, no blobs, nothing but smooth shine. 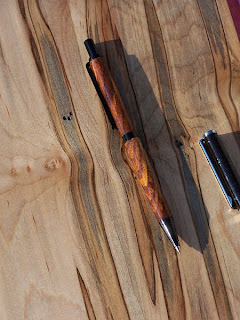 The hardware kit is a click pencil in black enamel. I'm curious about the durability of the black finish. I love how it looks right now, so I'm hoping it wears well. I just picked up some 1/4" (7mm nearly) brass tubes from Hobby Lobby. Two 12" tubes for $3.47. I also picked up some other goodies I'll talk about later. The tubes are for me to make my own barrels for some existing mechanical pencils I have. Classic Pentel drafting pencils, and some inexpensive all plastic pencils. I'd also like to make replacements for the housings of some of my favorite gel pens. I haven't decided how to do that yet, so stay tuned! After linking my blogs, pls leave a reply at tyopras[at]gmail[dot]com. Hoping an early reply from you.